Hello everybody! Thank you to everyone who commented on my last post. I’m now on the hunt for amazing fabric suppliers in the UK and will write a little round up soon about my plans. I’ve just got back from a last minute holiday where I did a lot of plotting for how to share snippets of my diy wedding dress. 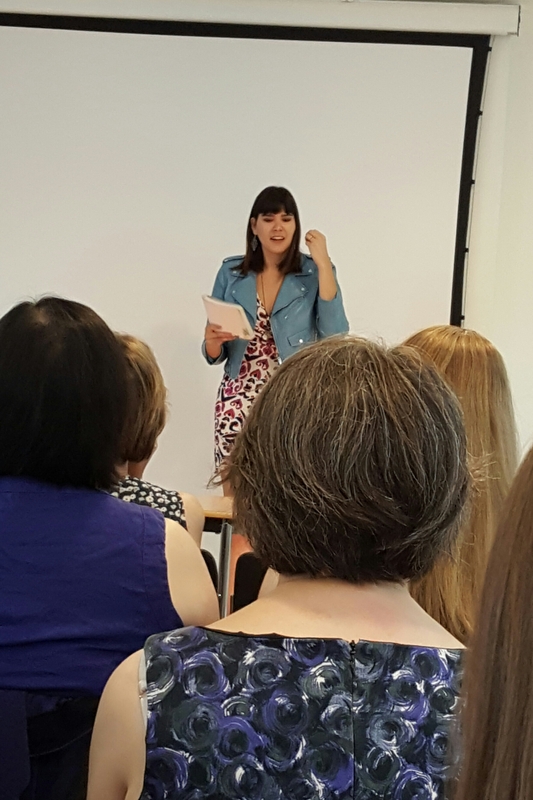 I thought it would be nice to share my thoughts on the recent Sewing Weekender hosted by Rachel and Kate of The Foldline and Charlotte of blog English Girl At Home and what I made. There were a limited number of spots so I count myself lucky to have nabbed one. I didn’t think my boss would mind too much if I bunked off for five mins to buy myself one as a birthday treat. To be fair he probably never realised. When 57 attendees arrived in sunny oCambridge we were met by an amazing sight; goodie bags being handed out as you stepped in with treats from Village Haberdashery, Love Sewing, Remnant Kings and Abakhan, Janome machines set up on large tables with ribbon tied boxes of haberdashery from Adam Ross, swap items stacked high and enough tea and coffee to keep us charged all day. I sat on a table of four with my friend Ruth who travelled down from Yorkshire to meet new sewing friends (I definitely recommend following her on twitter) and Sarah who I’ve enjoyed following online, who headed over from Suffolk with her mum! I feel like such an idiot but I can’t remember Sarah’s mum’s name. I hate it when that happens but it’s best to just hold your hands up and be honest about these things. It was like the shirt table as there were two shirts and a shirtdress being sewn, but I bucked the trend by sitting and hand sewing while gossiping. I’d decided to finish my new circle skirt Cambie with matching bias tape which I pieced from 20 scrap bits of my fabric. Thankfully I got everything finished and Ruth kindly snapped some pics for me which I’ll share at the end of the post but here’s a cheeky pic of me and Louise in our Cambies together! (Don’t you love her use of border print cotton from Gertie’s fabric line?). 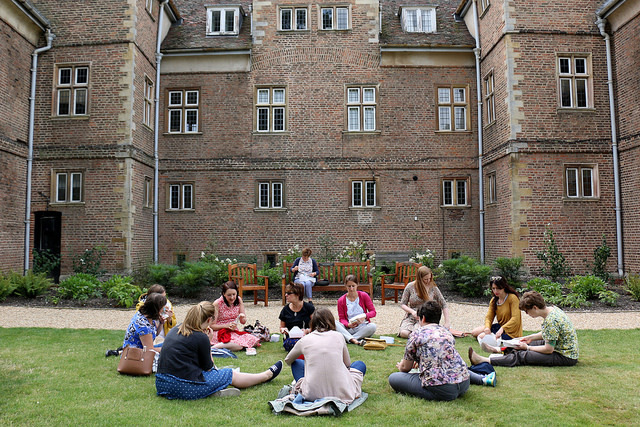 The Saturday was dedicated to sewing and everyone busied themselves with different projects whilst “Prefects” wandered around offering advice, fitting help and biscuit-based support, there was a fabric and pattern swap, lovely lunchtime walk into Cambridge and for the overnight crew a dinner in town. I stayed with my in-laws to be so we could celebrate the engagement with the whole Scarr family which meant sadly missed out on that last part. 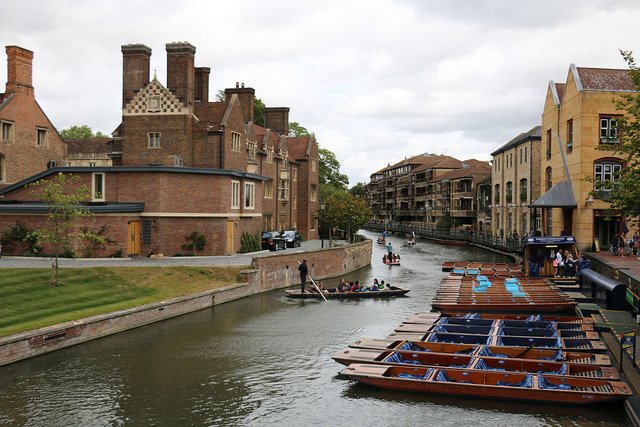 It’s so funny but after 6 and a half years dating a Cambridge man I have still never been punting and only a handful of times to the town centre!! Sunday was structured around lectures that were funny, insightful, thought-provoking and educational. The clever and charming women who spoke were Rachel, Grace, Marilla, Elena, Tilly and Gabby, talking about wardrobe planning, pattern design, small design businesses and vlogging to touch on a few topics. There was no need for sewing as the lectures were thoroughly engaging. One thing that resonated with me was cataloguing my stash for better planning and so I’ve begun adding scraps on a keyring of index cards. I also thought a lot about my wedding dress plans and what I’d like to achieve and learn from the project because it really needs to be a learning experience for me as corny as that may sound. 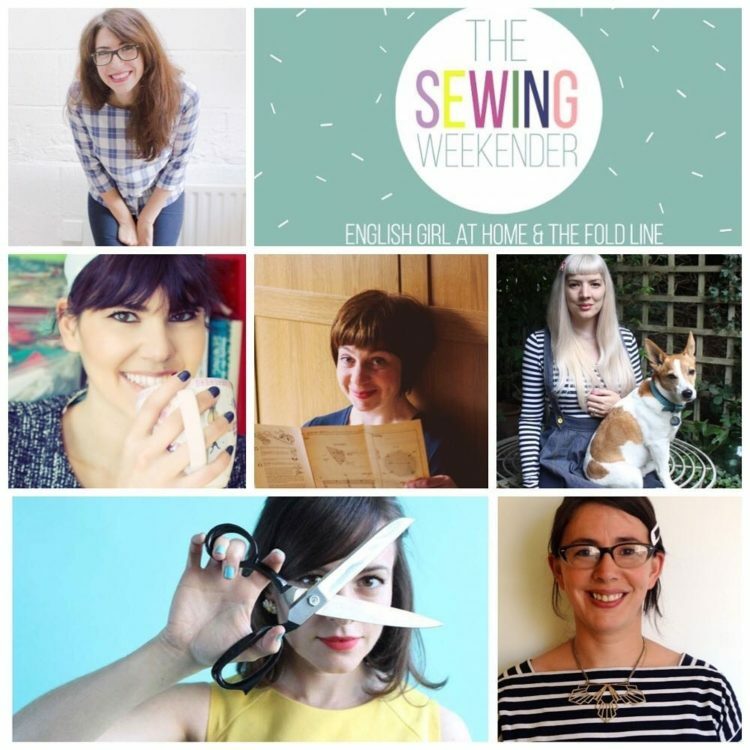 So I won’t cover what others have said but I would like to heartedly recommend that you get a ticket for the next Sewing Weekender (we’ve totally badgered the girls into considering a repeat) and am honestly in awe of Charlotte, Kate and Rachel’s organisational skills. Ok, now here’s my dress. 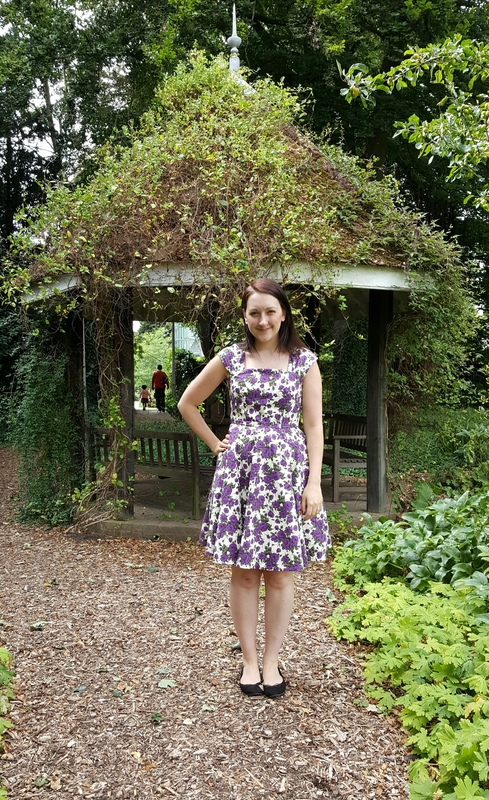 I know you’ve seen Cambie dresses frome me before (here and here) but I wanted to try adding a circle skirt to the pattern to see how it looked. Answer? I’m pretty damn happy with it. But I’m also very into circle skirts at the moment. It’s a little bulky around the pockets so maybe should have been omitted but hey, I like pockets. Again I omitted the waistband and used a straight neckline. A 22″ concealed purple zipper for a bit of fun too. The dress is fully lined in anti-static peach lining which means it’s tights-friendly and the skirt lining adds extra volume. The hem as I mentioned is bias faced and invisibly hand stitched. I only wish I had horsehair braid in my stash to finish the hem with! I cannot believe I found some Liberty Carline poplin in purple (variations seen here and here by me) at Birmingham Rag Market… I blumming love that place. Spotted during an awesome mini shop with Marie, Kat, Roisin and Helen (guest appearance from Sabs) a few months back. It was £8 per metre because it had a big flaw parallel to a good portion the selvedge about 10cm in but because it’s so wide I just bought some extra material and worked around it! Easy peasy lemon squeezy. 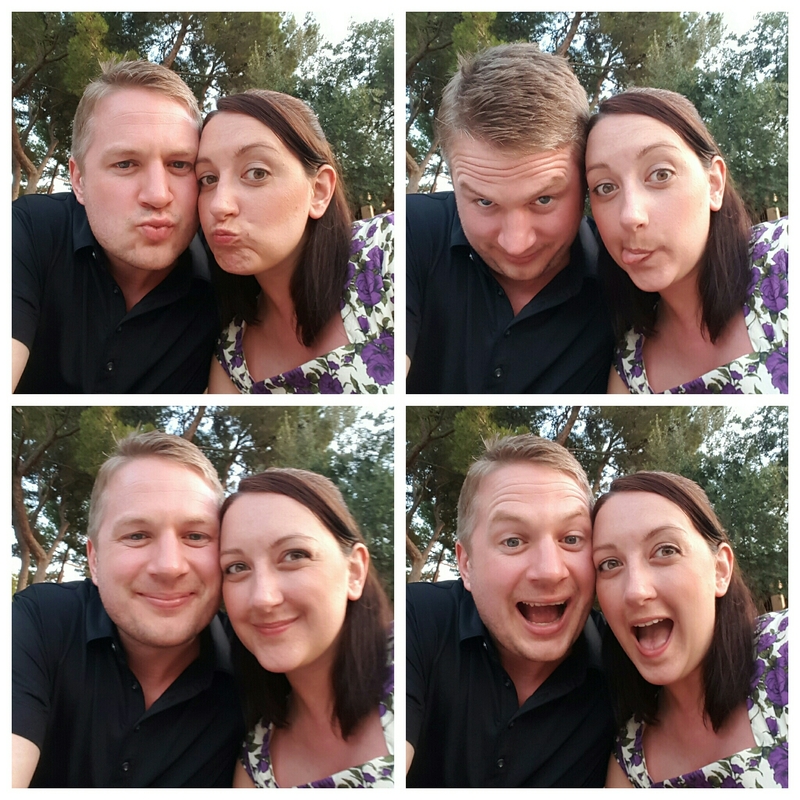 Here’s some silly bonus pics of it in action on holiday! Until next time everyone, drop me comments with your best score on a fabric shopping trip!! Sewing and wearing vintage-inspired clothing is something I love to do. I often find these patterns have more interesting construction details and work well in both vintage look and modern fabrics. When I heard the line up for McCall’s Big Vintage Sew-along I was really excited. There are so many excellent patterns in there. 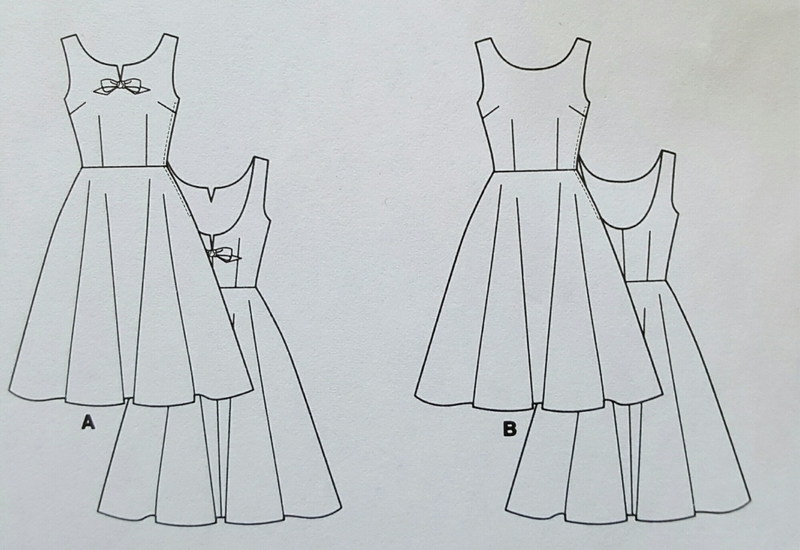 If you haven’t checked out the full edit head to this foldline summary or see the site www.vintagesewing.co.uk. There are 20 patterns in total, from the 1930s through to the 1960s plus a couple of Gertie’s 50/60s inspired patterns (they’re understandably year-less but stylistically probably just dip into the 60s). Over the coming months you’ll see versions of all the patterns cropping up online thanks to the BV Sew-along blogger tour, this will keep the inspiration bubbling and hopefully help you get started. If you just can’t wait to clock eyes on some vintage dresses, I’m here to help. I realised I’d already sewn four of the patterns from the edit! So take a look at my round up and let me know if you’re tempted to make any of the patterns yourself. I’ve included notes on things to watch out for and as getting the size right with vintage patterns is so important, detailed what size this 5ft4 lady with a 36” bust and 41” hip chose. Right, now you know how bootylicious I am, let’s get started! When I saw the line art for this dress I knew it had to be mine. I MEAN SWOOOOON! And I can honestly say this dress makes me very proud. I used a berry crepe fabric I bought in Walthamstow market last year and made self covered buttons. I used a coordinating zip and seam binding. I’m not going to fib, this isn’t an easy dress as there are a couple of areas where you really need to focus. The construction is 90% done by pressing under seam allowance and then topstitching the panels together. That much topstitching NEEDS a special foot or you’re going to go insane, unpicking and redoing. The other area to focus on is the pockets at the top of those swan head darts. This is where I had to read the instructions 4 or 5 times. After all my hard work I preferred them basted shut! Go figure. 1. 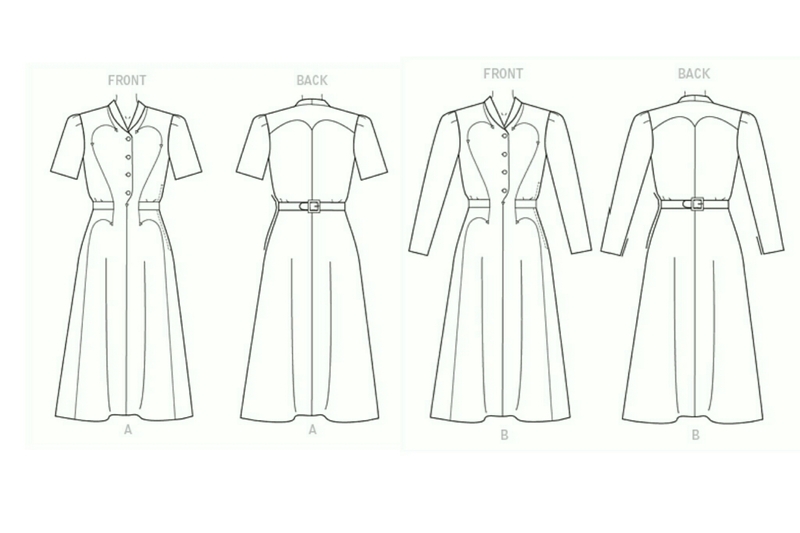 I cut two sizes down from my measurements to make a close fitting shirtdress rather than coat dress. This is predominantly a size 6 graded to a 14 at the hip. 2. The skirt was shorted 12cm. I probably should have just shortened by 8cm but too late now. 3. It took three toiles to adjust for my small bust and narrow shoulders, a slight swayback, plus to practice the pockets! 4. My crepe was very light and the dress is unlined so I’d recommend more of a triple crepe or cotton instead. 5. GET A TOP-STITCHING FOOT (I used my stitch in the ditch foot with a right hand needle position). A tea dress can be a wonderful addition to your wardrobe because it easily works for day time and occasions if done right. I liked the effect of B5209 when done in a print even though you lose the beautiful seam lines a little. This dress I’m definitely going to make another plain version. 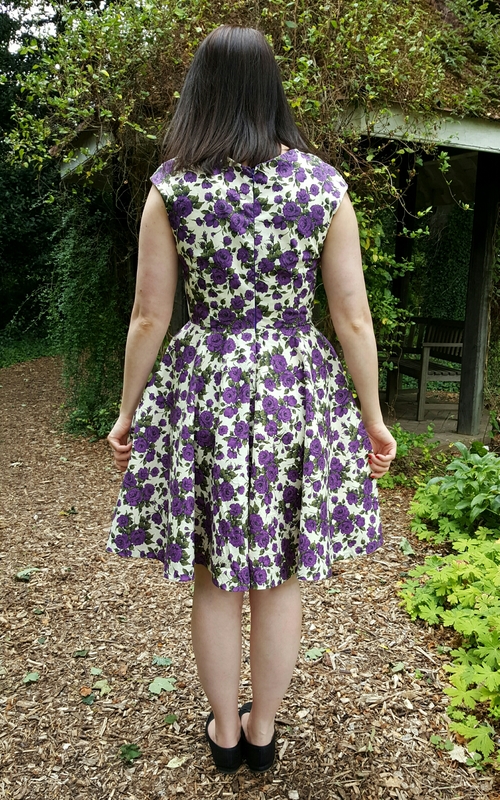 Here I used a Liberty tana lawn from Minerva Crafts (they have some left in multiple colours), white lining with a secret purple side seam zip. With so many intersecting seams, the instructions cleverly direct you to not sew to the end of each seam, but stop and backstitch where each intersection will sit. This allows you to fit each piece together accurately to get the beautiful star at the centre front. 1. The bodice is self lined but I added lining to the skirt to be tights-friendly. 2. There is a BEAUTIFUL underrepresented lip shape curve at the back neckline that is very eye catching when your hair is worn up. 3. A print will help disguise any slightly off alignment seams if you’re feeling the pressure to be accurate but an air erasable fine line marker is invaluable to this pattern. 4. I sewed a 6 around the shoulders and chest but blended out to around a 14 in the ribs and waist I also reduced the gathering on the bust by about 4cm by using the markings for size 6. Finally I lowered the bodice 1cm. This pattern is so lovely because it’s modest but interesting and has a surprise dip in the back. After two years in my wardrobe is comes out for weddings, parties, dinners out, work meetings and events, and once, a trip to the ballet! In a complete disregard for the pattern directions I used a viscose from Minerva Crafts. This makes the gathers at the shoulders very pretty, and the skirt extra swishy, but makes the back facing roll out occasionally. This dress is constructed using a partial front and partial facing to create the wrap effect in the upper chest. 1. I had to do a major hollow chest adjustment and full tummy adjustment, plus make the pattern a little more petite. 2. The outer fabric and facing is joined together BEFORE the shoulder seams are sewn, it’s suspicious but trust me, it leads to a neat finish. 3. While viscose is lovely, I’d definitely suggest something less fluid. 4. If you check out my blog there’s a tutorial for making a coordinating belt which is great to finish the look. OOH this one, I’m excited even introducing it. This pattern is great fun to wear as the bodice is flattering, the front cut out and scoop back are both eye catching, and the circle skirt is amazingly big! I used a 60”-wide Liberty carline poplin, which isn’t as nice quality as tana lawn but has a good weight and the print is so lovely, the fabric base doesn’t matter as much. I used a soft cotton lawn as the bodice lining, hemmed with bias binding and installed a lapped zipper. 1. This is an great pattern for a beginner as it’s easy to fit and construct, especially if made in a cotton poplin which handles well, is often the standard 60”-wide and comes in so many prints. 2. Bias tape is an excellent way to hem a circle skirt as it stretches to fit the curves. 99% of the time I machine hem circle skirts as life’s too short to sit and hand sew such a large area. 3. Wouldn’t this look good with a bow made from rouleaux loops! So if you enjoyed all this vintage craziness from me, look out for my BVSA post on the the 15th! This weekend two of my closest friends married each other. And I bawled my eyes out. 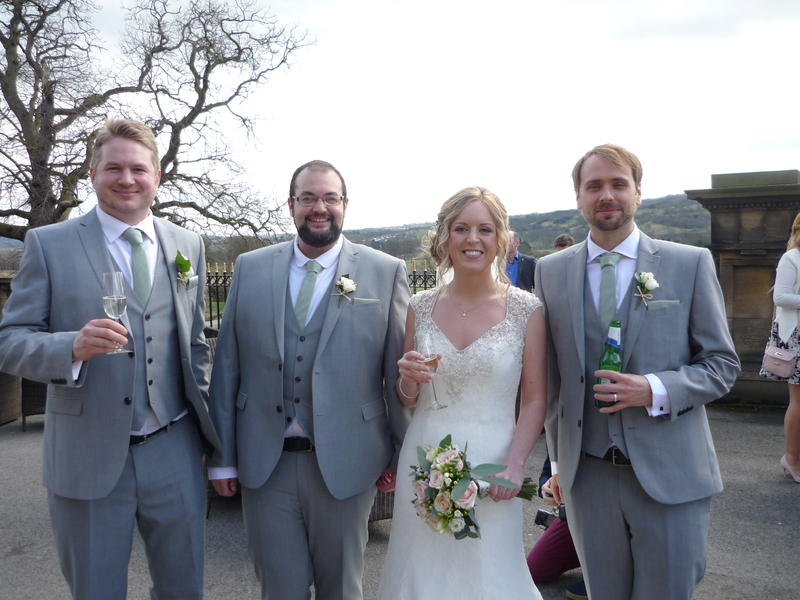 It was the perfect day and I’m so happy for them, even though I’m a teeny bit jealous of their amazing honeymoon plans. For the occasion I wanted the perfect dress. 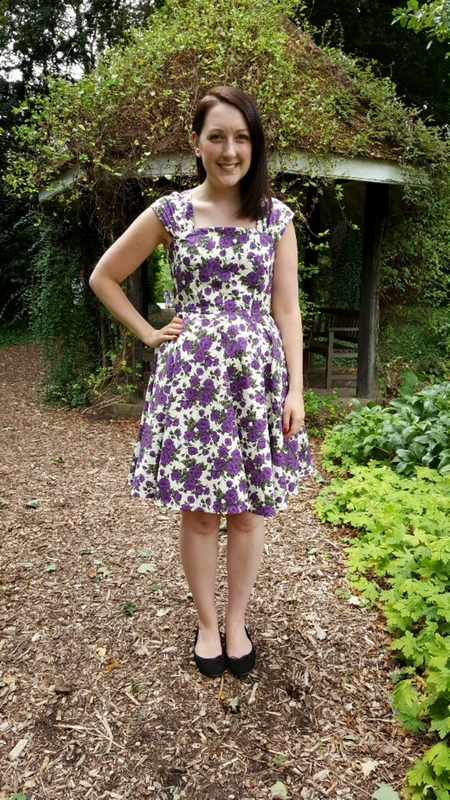 When I saw the new Gertie pattern Butterick 6167 I thought it was just gorgeous. Sadly it hadn’t been released in the UK when I fell in love with it. BUT WAIT… Sewing Superhero Sonja from Ginger Makes got hold of a copy and posted it over for me!!! How sweet is that!? I bought 2m of Liberty Carline poplin from an ebay seller called Fellabird Fabrics while I waited for the postman to come a knocking. This is a smaller version of carline, in a beautiful pink. The dress features a gathered shelf bust detail, boning, spaghetti straps and a full skirt. The bodice is self lined and I used polyester lining for the skirt. Interestingly the dress is cut on the cross grain! I thinned out the straps and took a whopping 6cm off the hem. Plus I added a huge hem ruffle (twice the width of the skirt) to the lining to act as a fake petticoat and boost the shape. It’s a pretty good pattern if you’re interested in learning how to bone a bodice and sew a lapped zipper. I confess I didn’t really need to learn those things but I appreciate that they’re included. 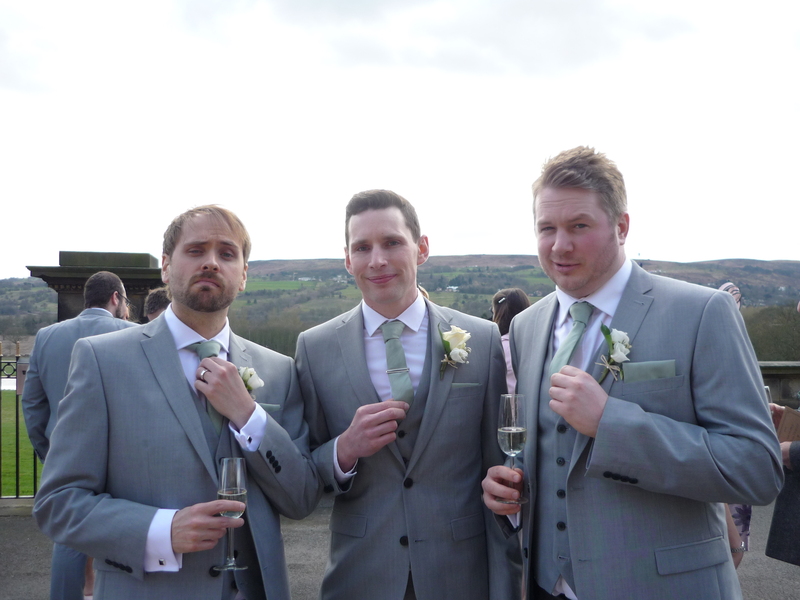 The other joy of the wedding was that it was my honour to make the ties and pocket squares for the Groom, groomsmen and page boys. Look at these handsome men! When I introduced Mark to my University friend Nicola I never thought it would turn out so well. Mark, Alex and Matt have been in my life for 15 years and I love that they’ve welcomed Jimi like they’ve known him that long as well. He made a very handsome usher. 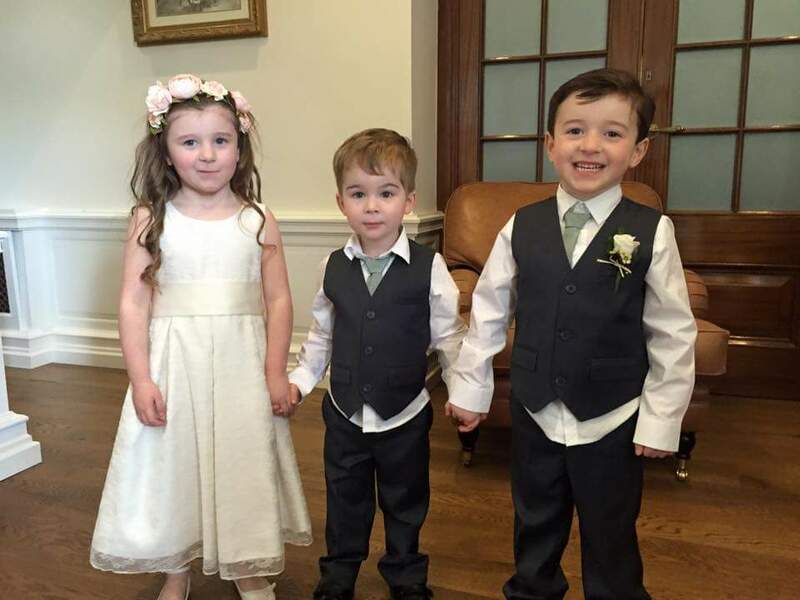 I know the men look dashing but come on, are those not the cutest kids you’ve ever seen? I made 7 men’s ties, 7 pocket squares and 2 “fake” ties that fastened with velcro. I drafted patterns from existing ties and googled “sew your own pocket square”. The fake ties were the hardest to wrap my brain around. 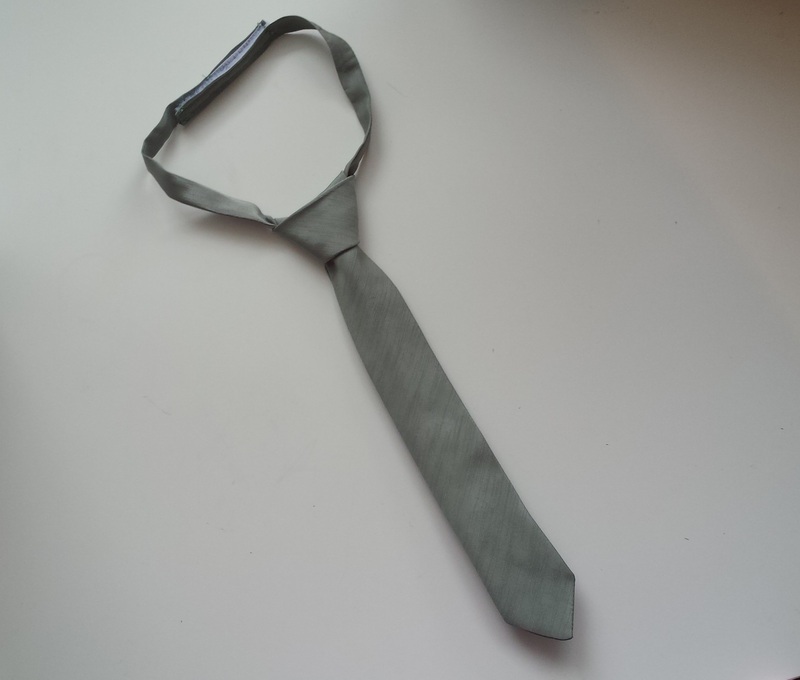 I’m half-tempted to make a pdf of the kid’s tie and make it available as a free download. It’s kind of the thing I’d have been happy to find when I was prepping to make these so maybe someone out there would find it useful? So that was my Easter Saturday! Did you have a fun long weekend? Toot Toot! I’m blowing my little party horn! 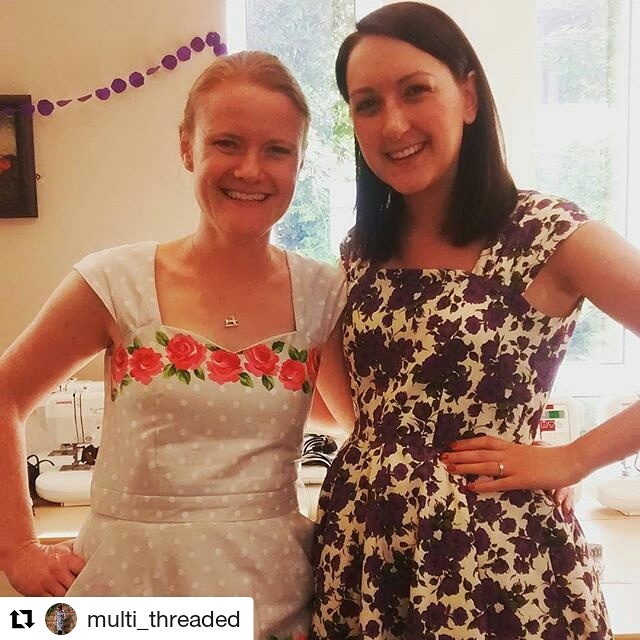 I bloody love the sewing community!! I’ve been nominated for another Liebster award and a Super Sweet Blogger Award. Jo from Sew Little Time is an awesome kickass sewist. Her blog is great fun to read, she’s a good twitter friend and, as I learned at the blogger meet up, an excellent dinner partner. 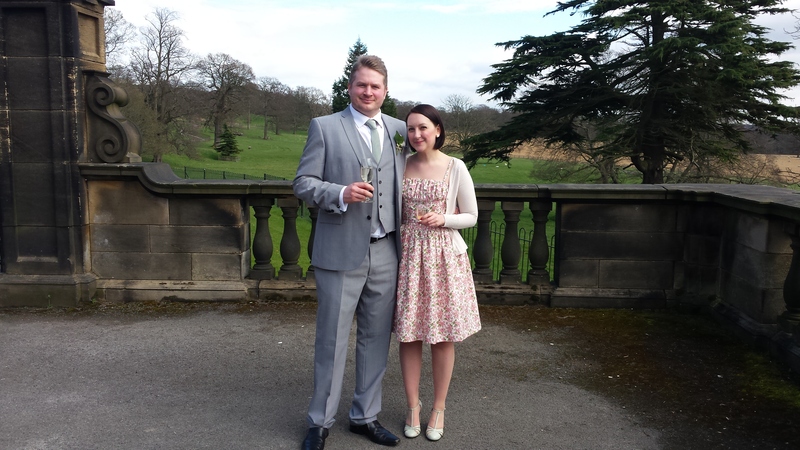 Check out her Mad Men dress, Anise and all her lovely knitting for starters! Jo has thrown down the gauntlet with questions for her nominees. There wasn’t any of that last time around so I’m happy to play along. 1. What is your favourite film of all time and why? I don’t see any shame in admitting this. I totally heart First Knight. I wish I could say a cool film but it’d be a fib. I can’t really say why but I love Richard Gere as an American Lancelot and Sean Connery as a Scottish King Arthur! Awesome fun. Maybe it’s the mystery of Camelot. Who knows. Have you seen it? Have I gone up or down in your estimation? 2. What kind of holidays do you like – beach? city break? raving in Ibiza? Do tell! I love the sun. It’s not about baking myself that much, more about being totally warmed through, getting vitamin D and feeling really healthy (doesn’t everyone feel more healthy in bright warm sunlight). My favourite place to visit is Melbourne. Let me sit in the sun with a good book at St Kilda and I’d be a very happy lady. 3. I spend a lot of time commuting – if you had a spare hour on the train, what would you do? I do the same! I have an hour each way to waste on the way to my office. I read blogs, work on Almond Rock posts and play on my social media accounts. I really want to get back into reading books on the train so I need a bigger handbag me thinks! 4. What is the best sewing book you have read? I think my current favourite is the Merchant and Mills sewing book. Its very cleverly written to be gender neutral, charming and inspiring. I learnt some great new tips and really responded to the design and layout used. Wovens all the way baby! It’s one of my New Year ReSewlutions to get better at knits… but hey crikey we’re nearly half way through the year already! I should probably mobilise on that. 6. What is your favourite blog? Oh no you don’t. I’m not picking a favourite!! I love so many. There are blogs with amazing layouts, great clever features, beautiful clothes, diys and crafts, and most of all hilarious happy people who I enjoy reading about and chatting to. 7. What other crafts do you do and which is your favourite? Honestly I’m afraid I don’t really do much else. I dabble with jewellery making but not enough to say it’s a secondary craft. I read a lot, watch epic movie marathons and wax lyrical about James Bond. I also like to think I’m a pretty decent baker and cake decorator. I’ve learned from the best though so is that really a craft or more of a handed down family secret? 8. What is your karaoke song? For a big old extrovert I’m not really a fan of karaoke. I do have one ace up my sleeve. Think Nelly…. Sweeeeeeeet. I’d love to live off dessert without consequences… and bread! Give me a banoffee pie and I’ll call you my best friend! 10. What is your favourite accessory? At the minute it’s my red leather satchel. I can’t stop using it! 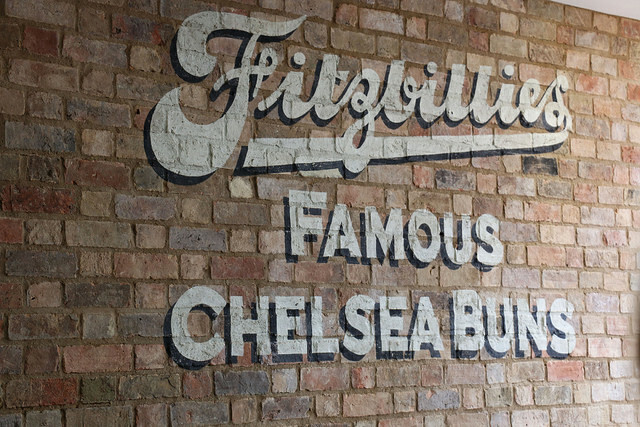 I got on my way home from the epic London meetup so it always reminds me of sewing adventures. 11. If I gave you £50 ($78 US, $82 Aus) to spend on fabric, patterns or craft supplies, what would you make from it? Links please! Eeeeek I’d want a spending spree! But to be more restrained… I’m currently cooking up a plan for a shirtdress so I’d buy 2 metres of pale pink carline rose tana lawn (£44) and Simplicity 1880 (£8). Then I’m out of budget. Oh. If I got the pale pink cabbage rose cath kidston print fabric (£25) instead of Liberty I could also squeeze in an order of a belladone from Deer and Doe perhaps? Next up the Super Sweet Blogger Award which was given to me by lovely Lara of Dreaming of Avonlea. Thanks very much Lara. I had the pleasure of her company in Birmingham this weekend. She is fun and talented and dreams of dresses! I mean after hearing that you’ve GOT TO check out her blog! She’d like me to answer 5 Super Sweet questions. And to nominate a baker’s dozen (13) of other deserving bloggers. A: Cake I think… just edges it out. A: CHOCOLATE are you crazy?! A: Banoffee pie all the way. Or as close as you can get to it! Q: When do you crave sweets the most? A: As soon as I go on a diet. But mostly after dinner time. A: Nothing to report here. It’s very hard to abbreviate a three letter name into something cuter! I’m very grateful to the sewing community but for these awards I’d like to nominate my favourite food bloggers for a bit of redirection! Maybe you’ll discover someone you like too?